Posted on April 27, 2017 at 12:48 am. You may know Washington as the Evergreen state, but when it comes to spirit, entrepreneurship, and dedication to preventing and ending youth and young adult homelessness, I say we are the “CAN DO!” state! On April 18 and 19, A Way Home Washington (AWHWA) was thrilled to convene teams from Spokane, Pierce, and King counties to launch 100-Day Challenges that will accelerate progress toward our ultimate goal: to prevent and end youth and young adult homelessness in Washington state. The teams carrying this important work include young people with lived experience of homelessness, staff from service provider organizations, local government agencies, and other stakeholders from the three regions. The expert staff from the Rapid Results Institute (RRI) facilitated and engaged the teams in exercises that raised a new level of awareness and excitement, even for seasoned front line advocates who have been addressing this issue for many years. To set their goals, the teams reviewed local data, policies, and resources. They also heard from the Governor and local leaders who encouraged them to be bold, try new things, and remove barriers – in short, to focus on getting young people indoors and on a path to stability and success. I was so impressed to watch the teams from Pierce, Spokane, and King counties step up and embrace the hope and promise of the Challenges. Collectively, the three communities set goals to house over 700 young people, with a strong emphasis on ensuring youth and young adults of color and young people who identify as LGBTQ have equitable access to support and services. Each team has returned to its community, and the 100-day clock began counting down on April 20. Please be sure to check our 100-Day Challenges page for updates on the progress made by each of the three communities. I want to thank our remarkable funders who are supporting the Challenges, including the Raikes Foundation and the Schultz Family Foundation. I also want to thank Governor Jay Inslee for his support and video remarks at the launch event, as well as other local leaders who expressed their support via video and by sending key staff to participate. That’s why I was especially grateful for members of the three teams who truly accepted the challenge, worked together in their two-day workshop, and represented their community and our state with pride, hard work, and dedication. And finally, a very special thanks to the young people who were members of the three teams who brought their unique insight, wisdom, and lived experience of homelessness to the discussion and planning efforts. 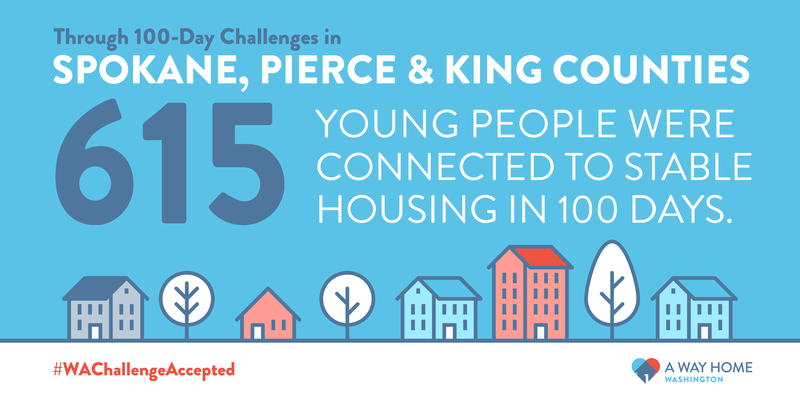 We don’t expect to end all youth and young adult homelessness in these next 100 days. However, we do expect our talented teams will meet their ambitious goals. And throughout the journey, we will all learn more about the resources, policies, and practices our communities need to make it possible for every youth and young adult to find their way home. Families and young people across our state are counting on us. You can follow the 100-Day Challenges and show your support by sharing #WAChallengeAccepted on Facebook and Twitter.